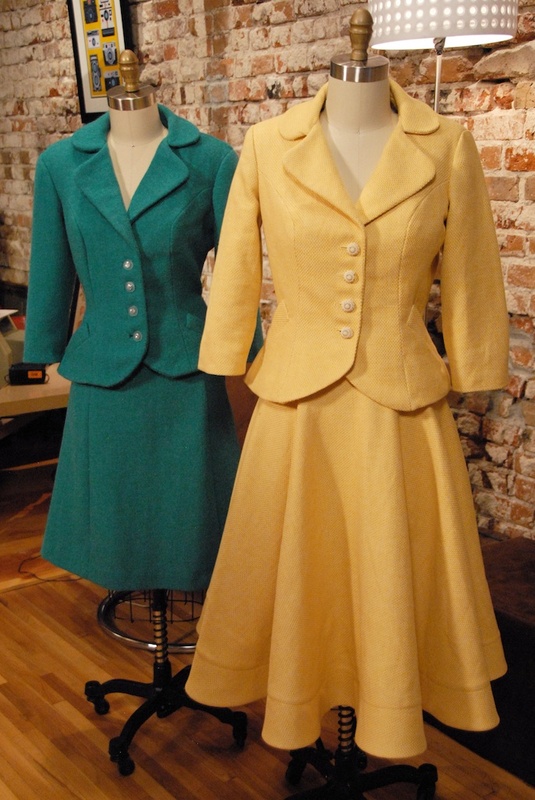 I've signed up for the new Craftsy course Sew Retro: Starlet Suit Jacket taught by the fabulous Gretchen Hirsch! This jacket has princess seams and a flared waist, how could I resist? There is two tracks to the course; fusible or hand tailoring. I am very excited to go all out with the tailoring techniques. It is super easy to incorporate hand tailoring because Gertie has included separate pattern pieces for the hair canvas, and even for the muslin back-stay. This will be my third experience with hand tailoring methods. Last year I sewed along with Gertie and the Lady Grey Sew Along, and this winter I sewed the houndstooth coat with many of the hand tailoring techniques. More pad stitching and hair canvas for me! I had a livingsocial deal at Mood Fabrics, I headed straight there for my fabric. I was drawn to this beautiful seafoam color. It's a wool coating, which is a little on the thicker side, but that will just make the padstiching easier to hide. The lining is a rose print silk, which is perfect for spring. The buttons, are from M&J, are match the fabric perfectly. I cut out and sewed the muslin this morning and it is also perfect. I am the exact size 10, don't you love when projects work out like this? Has anyone else signed up for the Starlet Suit Jacket? If you haven't there is a 50% discount on Gertie's blog : Blog for Better Sewing. Readin' my mind again, girl! I am so excited about Gertie's class and accompanying suit pattern. It seems like such a versatile, smart look. Wow, Erika - gorgeous fabric and button choices! I will really look forward to seeing your finished jacket. Are you going to make the matching skirt? I also signed up for the course, but I probably won't be making this jacket. I have my eye on a boxier, '60s jacket :-) But I'm really excited to learn something about the techniques, since I've never done any tailoring before. Thanks Ladies! I will post my progress. I'm excited to see your versions as well. How exciting! You're the first person I've come across whose started the jacket course - I just love the bright colours you've chosen for it! Divine buttons too. I'm looking forward to seeing the end result! I like to wear jacket as look professional and fashionable. You share great Starlet Suit Jacket. Its fabric and pattern is too good. Also colour is so bright.